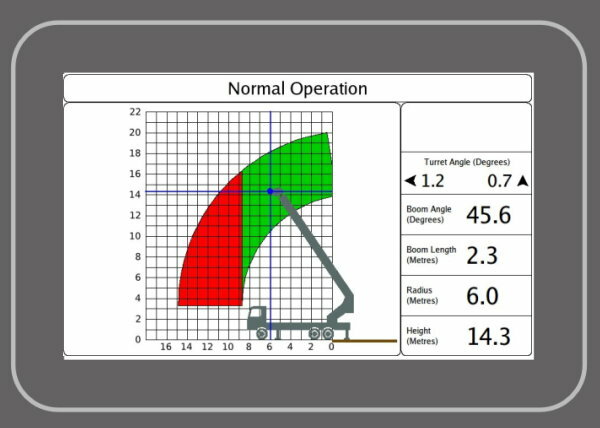 The SFPL displays a fully dynamic working range chart for the man platform. The segments on the range chart are colour coded to show the safe working region. The green segment shows the safe working range, any boom movements within this region are allowed. The red segment shows the unsafe range, if the boom is within this range the only movements allowed are to decrease radius to bring it back into a safe range. The rating chart also has an image of the truck and platform showing the current boom location within the chart. The current position within the chart is shown via crosshairs. 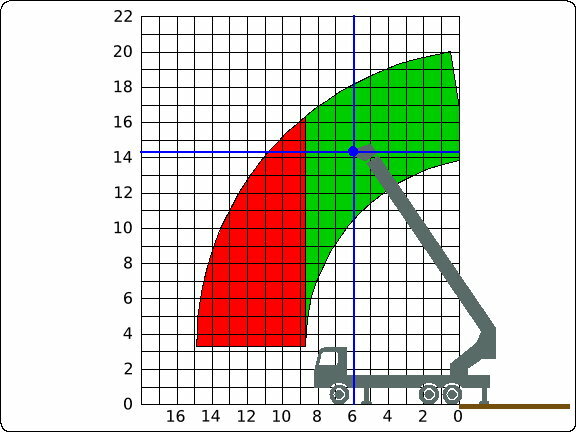 With the chart grid in 1 metre increments the operator can determine the distance the man platform can be safely moved. For more detail the operator can zoom into the chart. This will zoom into the boom location in the chart, as the boom approaches the edge of the chart the window will slide along to keep the boom location in view. The status window shows all the numerical values related to the boom location. The top of the status window is the status icon area, when any events that the operator needs to be aware of such as an outside envelope range icon will be shown in the icon area. Below the status icons is the turret angles of both axes shown in degrees. The arrows show the direction of tilt. 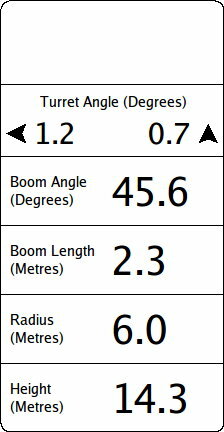 At the bottom of the status window are the boom position values; boom angle, boom length, radius and height.